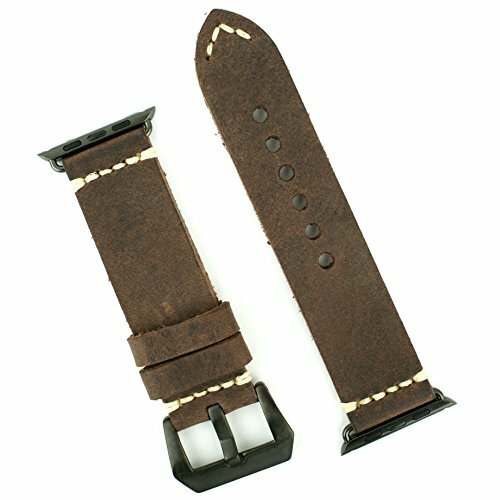 APPLE WATCH BAND Replacement band for 42mm APPLE WATCH BLACK STAINLESS STEEL Handsewn Italian Leather Vintage Strap (Dark Brown) by B and R Bands at Kode Fu Guru. MPN: AP42Bdkbrnmnm. Hurry! Limited time offer. Offer valid only while supplies last. Band is extremely soft and flexible for extra comfort. Comes with black stainless steel adapters that will slide on and off with ease. Comes with screwdriver and spare screws. Handsewn Minimalistic stitch for a vintage look. If you have any questions about this product by B and R Bands, contact us by completing and submitting the form below. If you are looking for a specif part number, please include it with your message.